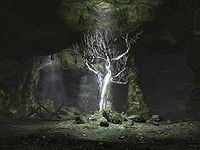 Gloomreach is a medium-sized cave in the Reach containing chaurus and Falmer. There are many samples of glowing mushrooms and chaurus eggs that can be collected from within this cave system. The easiest way of finding this is to travel to the inn Old Hroldan and then travel southeast from there. It is found on the far side of the river from the inn. It contains two zones: Gloomreach and Gloomreach Hive. There are many mudcrabs that can be killed and harvested along the banks and several slaughterfish are in this part of the river. There are many juniper trees along the route and a couple of hanging moss plants as well as three fly amanita and a white cap fungus growing around the entrance. Upon entering you find yourself in a natural cave with an imp stool fungus growing in front of you as well as against the cave wall to your right. The cave turns to the southeast and you can see a tree bathed in a pool of natural light from above. As you move forward you will see a juniper tree off to the left in another pool of light; on the wall beside this is a mora tapinella growing on the cave wall. As the cave opens up, there is a bleeding crown fungus to the left of you. Following the cave around to the left you come to two patches of blisterwort together, near the juniper tree. Further around there is a tunnel heading to the northeast with a lit brazier to the right of the entrance. There are two rock pillars in the cave and above you on the southwest wall is a ledge. Following the tunnel to the northeast, after a short distance the tunnel turns to the southeast and then opens into another cave with a juniper tree located in this area. On your left there is a partially buried cart with a pickaxe inside and another beside it. To the right of the tree, the cave is staggered and continues to the southeast. Tread carefully as there is a Falmer patrolling this area. Growing to the right is a bleeding crown and a fly amanita fungus and there is also a pickaxe on a barrel to your right. Continuing forward you pass under a wooden scaffolding tower with another pickaxe next to a bed roll underneath and a bleeding crown fungus on the left. To the right of this is a barrel with a copy of the Restoration skill book Withershins on top. Past this you come to a junction with a corundum ore vein on the ground in front of you as well as a path continuing toward the southeast and another on your right to the south-southwest. Taking this second tunnel leads to a small cave with two chaurus and several chaurus eggs and a bleeding crown. Fighting these may well alert several Falmer to investigate. The exit to this cave is to the southeast and comes out above a second path below. There is a blisterwort fungus in front of you. Turning right takes you past a bleeding crown and blisterwort fungi along a ledge over and on the left of the below path. The ledge continues to the northwest and the path below opens out into an open area with several cages, a Falmer tent and stairs up at the far end. As you pass a couple of crates and barrels, caution is needed as there is a Falmer lurking here. Before the path splits again to the left the ledge follows the cave around and descends to the lower area. On your right it joins with a wooden scaffolding structure that goes around a rock pillar before exiting the cave heading northwest. Back at the original junction continuing straight ahead, the tunnel bears to the southwest before you come to a dead goat with a broken cart to the left. Just past these is a braced section of tunnel, with the other path overhead. On the ground behind this is a corundum ore vein. You pass between two cages, both adept locked and the one on the right holding a skeever. There is a table in front, to the left holding a woodcutter's axe and a leather helmet and past this is a cart on the left and a damaged cage on your right. You will also find a third corundum ore vein ahead. There is a dead bandit inside the damaged cage. Opposite against the north wall is an imp stool and a bleeding crown fungus. Further to the left is the Falmer tent containing an unlocked chest. Continuing past these you pass several of the supports for the wooden scaffolding and by the bottom of the ramp back up to the higher ledge is a bookcase which contains two pickaxes and a random poison. Opposite this in the western corner is a set of shelves containing a knapsack under a scaffold tower. On the ledge, after taking the path that crosses the room around the rock pillar you will exit into a tunnel heading northwest. You will find an unlocked chest on your left; opposite this is a straw bale and a stack of crates and sacks. Among these is a bottle of alto wine, a pickaxe and a knapsack. Past these items is a smelter and behind this leads to Gloomreach Hive. Upon entering you will be in a tunnel that twists and turns as it proceeds, until you come to an arch with glowing mushrooms above. There is a patrolling Falmer around this area who may have already set off a tripwire that activates a claw trap hinged on the left. This brings you out onto a path that leads to the right and winds its way around and down the room. To your right is another tunnel to the south. There is another Falmer and a chaurus here; while fighting these a third Falmer is likely to come up from below to investigate. The south tunnel leads into a small cave only containing chaurus eggs. Descending the path around the cave you pass an imp stool, three bleeding crowns and then a second imp stool. At the bottom there is a path heading to the southeast. Before going in that direction, there is a third imps stool against the north wall and in the water is an unlocked chest and a skeleton floating on the surface. On the ramp that leads back out of the water there are two blisterwort fungi and a bleeding crown fungus under the water. On either side of the tunnel heading southeast there is also a Namira's rot fungus. Follow the tunnel as it twists and turns and rises until you reach a closed gate. In this area there are two Falmer. One is patrolling near you, one is off to the left near the back of the cave, a third will investigate any fighting from a ramp leading up from below to the south. In the eastern corner is a Falmer tent and along the back is a fence with an unlocked chest next to it. Descend the ramp in to the south and you come to another Falmer tent with an unlocked chest to the left of it. If you have come to Gloomreach to retrieve an item, this is where you will find it. 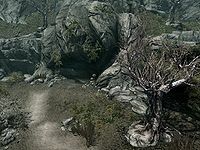 The path does a couple of switchback to reach the floor of this cave and there is a final Falmer in a Falmer tent, up a rise to the northwest. On the cave floor you can find many fungi: four blisterwort, an imp stool, two Namira's rot and three bleeding crown. There is a closed gate to the south that leads to a shortcut tunnel that returns to Gloomreach and the tunnel down to the ledge previously seen near the exit from these caves. It is possible to bypass almost all of the first zone, including all of the enemies in the zone, by climbing the wall in the southwest part of the first cavern, effectively entering Gloomreach Hive through the exit.